The past 12 months have been pretty good for TPP personally. Things have gone very well although not without some aggravating episodes, e.g., getting you retirement money out of Lincolnland's clutches. The F1 had a good year, new job, higher salary, engagement, and nothing makes parents happier than to see good things happen to their offspring. The Phactors had a good year; anytime you can spend a month in Tuscany, you've had a good year. And how did our gardens grow? Pretty well actually, and a good start was made on refurbishing the front garden after having all its failing trees removed. Professionally things went very well as they do when you finally get your book published. Yea! Although older for certain, our health remained good in comparison to that of many other people. Always best to have health insurance and not need it. And while Affordable Care provided some relief from worry for many, circumstances and bone-headed states still keep many people left to play the health lottery. It wasn't a good year in politics, international events, diseases, human relations, and the environment. It was good to see the failed, cold-war foreign policy toward Cuba finally gave way to common sense (Hey, Marco, the 1960s called and they want their foreign policy back.) and reality. It took regular doses of margaritas (negronis during August), the Daily Show (and John Oliver), and blogging to retain one's sanity. Yes, this is a form of therapy, blowing off steam, and generally connecting with others in a rather one-sided sort of way; TPP blogs, 323 of them to be exact (as soon as he hits the publish key) - and around 250,000 page reads with few comments. And this is not much different from teaching college students, where you wonder how many in your class were really there, but there will be no exams. The new year offers a lot of potential change too; TPP will be working on some new projects and community activities to keep himself out of trouble and amused. Surely there will be some bloggable material arising from that. Best wishes for the new year to all. Great Blog Galaxy - Almost big enough to be seen! 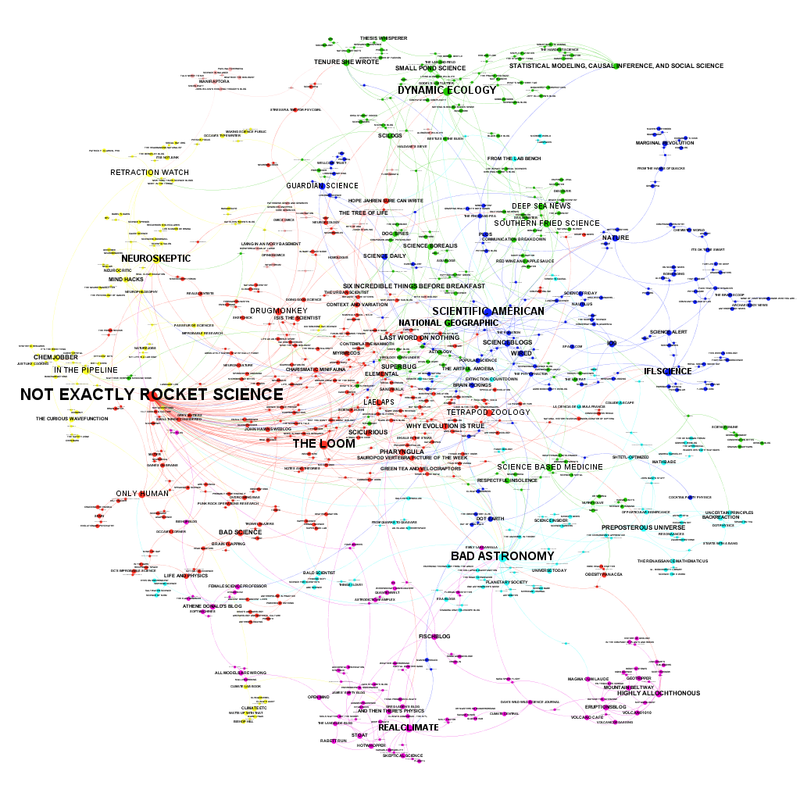 This galaxy of blogs is the result of asking over 600 science bloggers what science blogs they read and then construct it as a network of bloggers reading blogs. The more people who read your blog, the bigger your dot and name. And right there in the right middle is The Phytophactor, almost big enough to be seen! If you drop straight down from the C in American of Scientific American, there's TPP. Wow, does this ever give your ego a boost. And the funny thing is that TPP usually doesn't read that blog. Yikes, my dot just disappeared! Just kidding! Here's a video of a pretty powerful optical illusion of a checkerboard. Non-random placement of the white dots creates the illusion of a bulge. When the dots are removed, the illusion disappears. Several other similar optical illusions can be accessed via this video and they all are pretty troubling in that you can't make you brain see what is actually there. Why does TPP look at such things on a Monday morning before the second cup of coffee, as if that would matter? In other instances of optical illusions, TPP has noticed that he often has a strong reaction to such illusions and wonders if that is in some way related to all his years of looking through microscopes? HT to Mano Singham's blog; he's a physicist. It's been a good holiday season for flowering. As a consequence of spending summers and early fall outside, almost all of our tropical houseplants regularly flower. This was a particularly good year because so many plants came into flower at one time, but some were sort of over whelmed by the holiday decorations. Nonetheless several visitors did notice and appreciate several of them. So here's the list: forced paper white narcissas, the queen's tears (a bromeliad), a mistletoe cactus, the big blue bromeliad, an azalea (which itself gets decorated), an Aeschynanthus (a gesner), an orchid (an unknown hybrid). On the whole a pretty cheerful display. Although all have their charm, the queen's tears is a favorite because of the unusual combination of colors, which is good because otherwise the plant is not particularly attractive. Most of these have been featured in this blog before, thus the links. Holiday gift giving provides lots of data points for observing packaging. Is there anything with more wasteful packaging than men's shirts? Let's see if the packaging can be listed: an adhesive size sticker, a cardboard tag attached by a nylon anchor rope, a plastic ring around the collar, a plastic piece over the neck button, a cardboard collar insert, two pieces of tissue paper inside, a piece of cardboard inside, and three metal paper clip sort of things to keep the shirt folded. You end up having to start your own recycling center just to try on the shirt. Not all shirts came that way. A heavy-duty, out-of-doors sort of shirt from a place up in Maine, was folded nicely inside a plastic bag, and there was only one other cardboard tag attached by a piece of twine! In a women's store all the merch was neatly folded or on hangers, and without all the extras. So what is it with men's shirts? Are they supposed to look like they are starched and just back from the laundry. In the day's before stay-press fabrics, it cost 50 cents to have a shirt laundered and just have the cuffs and collar pressed. Pull over sweaters completed the subterfuge. Not everyone was unhappy about the packaging; the kitty-girls found the ribbons, tissue papers, and boxes lots of fun, especially when a new catnip, furry mouse is added. Gift beverages now almost universally come in specially made, and rather durable, gift bags, which can be saved and reused. We have probably gotten, and given, at least one of these on several occasions, and on the gift bag travels. While rather festive, it's too bad so much material gets either discarded or recycled. It was also interesting to see the surprised look on some retailers faces when you produced your own shopping bag. Grocery stores have become used to them, but not so most others places. Clearly the majority of people got and wanted those big bags provided by the retailers. The kitty-girls also like those, but some of the handles pose a choking danger and have to be cut, thereby rendering the bag rather useless from our perspective. 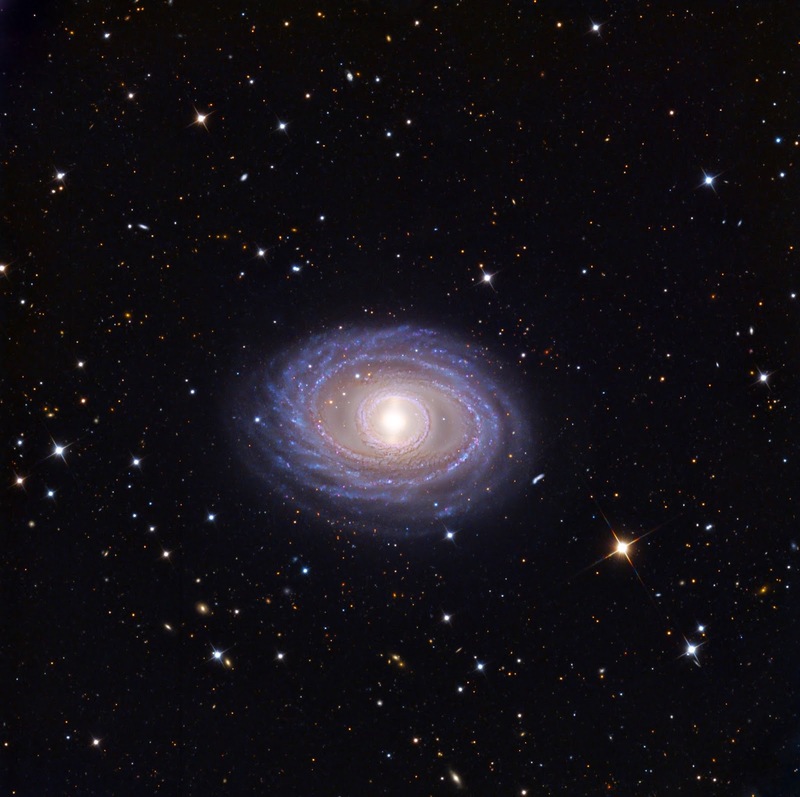 This is a pretty amazing photograph of NGC 1398, the barred galaxy. There is something strangely compelling about images like this of things so huge and so far away. Their camera must have a mighty fine zoom lens. Think about how many stars are in such a galaxy. Then think about all those other little lights in the background that are also galaxies (all of them), and just in this one little bit of space. Some intellect out there is probably pointing their see-far thingy at the Milky Way, and saying, let me write a blog about how amazing this is. Did you notice that the days are getting longer? Yes, the world will not be consumed by darkness as the days continued to shorten. But rather than have fires, or feasts, or religious events to banish the darkness, TPP knows what really does it. On this solstice our premier symbol of rebirth and spring arrived just as we had hoped to banish the darkness and let the sun begin its trek back higher in the sky (Yes, it's axial tilt, but hey.). The first seed and plant catalog came by mail, and just like that things seemed a bit more like spring. Actually it was not all psychological, the high temperature here abouts was around 50 F today and lots of spring sprouts can be seen appearing as things have already had several weeks of quite cold weather in November. If the temps don't get back to a more seasonal range some plants are in for quite a surprise. As it is witchhazels are in flower and so was a dandelion in a protected south-facing location. Either that or they'll be bun-bun nibbles. This recipe showed up in last Sunday's ChiTown Trib just in time to be used for part of an Italian dinner for friends and family. In August TPP made zabaglione, an liquor flavored egg custard & whipped cream combo for a topping on fresh mixed berries, and we had it for breakfast no less! Pure decadence. So this is basically a hooched up version of the same complements of Italian cookbook author Domenica Marchetti. Part 1: 1 cup whole milk, 1 cup heavy cream, 1 cup sugar, 1 tsp vanilla extract (or use 1/2 of a vanilla bean slit open and scrape the seeds out and cut into several pieces). Stir together the milk, cream, and sugar in a sauce pan over medium heat. Add the vanilla and stir until the sugar has dissolved. Keep stirring until the milk just begins to simmer. Do not let it boil. Remove from heat. Part 2: 4 large egg yolks, 1 cup sugar, 1/2 cup dry Marsala, 1/2 cup vodka, 1/4 cup brandy (a dark aged rum or bourbon could be substituted). Whisk together the egg yolks and sugar until thick and lighter in color. Add a dribble of the milk/cream mixture and whisk vigorously to keep the yolks from curdling. Continue adding the milk/cream mixture little at a time and whisking thoroughly until it is all incorporated. Whisk in the 3 liquors. If you used the vanilla bean remove the pieces. Pour into a stoppered bottle and chill thoroughly. This will last up to 4 weeks in the refrigerator. Shake before serving especially if you used the vanilla bean. This is one seriously sweet, egg-noggy, high octane concoction. It was a busy weekend socially and the internet connection was flaky, even more than usual so no blogs. Since the Martha Stewart fairy dusted our home with decorations, some one volunteered to host a church open house. This can present several questions of etiquette. Do you serve a jar of home canned sweet pickles that were dated 1999? OK, that's pretty easy. No, and they weren't that good even when young. Do you serve a bottle of wine that you don't like to get rid of it? Rieslings are just too sweet, but yes, you can serve it because some of you guests may like that type of wine and it wasn't 15 years old like the pickles. Is is ethical to serve a smoked salmon dip that you adore even though most of the guests might be vegetarian? As a note, all of the other snacks and dishes to share were non-meat. Well, of course it's OK, and all the more for yourself! People have to keep an open mind. Do you serve the pickled Brussel's sprouts just because your boss made them? Heck yes, but not because of the boss, but because otherwise they might be left for you. Do you have to worry about wishing people Happy Holidays vs. Merry Christmas? No, they're Unitarians and very accepting of holidays in general. Our dinner group is trickier because of a large contingent from the Temple not to mention Buddism, Hinduism, and Pastafarianism. Growing up in NY you kept your options open and took off all the religious holidays. Do you discuss politics or current events, or steer conversations to the football playoffs? Around here people take their football seriously so you are better off sticking to current events and politics. The concensus is that SONY was foolish to make even a stupid movie about a real head of state. Did anyone doubt who Charlie Chaplin was mocking in the Great Dictator? It would seem there were no major faux pas or other breaches of etiquette or protocol. The offending wine was consumed and enjoyed. Pickled Brussel's sprouts by comparison made the ancient pickles sound good. Actually, they were edible, but not actually in the good category, but if enough people come, they each only need make the mistake once to accomplish our goal of consuming them. Many people enjoyed the salmon, and TPP still had some left over for himself. All in all a fine open house. The release of the summary of the torture report more or less tells us something most people already knew, so it's hard to know how to respond or comment. Only a real Pollyanna would think the USA doesn't have numerous secret closets filled with dirty-dealing skeletons. The only real surprise was that this report acknowledges as much of the dirty dealings as it does. Even still it won't make a big impression on the "USA is number 1" crowd; us cynics weren't disappointed, again. Everyone pretty much already knows that torture as a interrogation technique doesn't work, and this just reinforces that view. Everyone pretty much knows that the CIA and other spooky sets of initials lie, all the time, they can't help it, they're spooks. And if anyone had any doubt that Darth Cheney is the worst person on Earth, his responses certainly have cleared that up. Mostly TPP felt a great sadness that so many people in this country and in our government operate and promote politics and policies of fear, and that they have been so effective in messing with our national psyche. Tom Tomorrow nails it, and provides us with a grin in the process. Strange when your primary source of hope is cartoonists. Shamanistic origin of Santa Claus? Far out, man! In this nifty little article about Amanita muscari, the fly agaric, a spectacular mushroom, they suggest a story that TPP had never heard before. Now any botanist who knows their humanistic botany knows that this mushroom is a well known hallucinogen and toxic enough to scare the pants off this botanist. Yikes, don't try this mushroom at home folks, it could be your last trip. Siberian shamen were known to favor living in groves of birch trees, trees of life in some cultures, and the fly agaric forms symbiotic relationships with the trees' roots. Naturally the mushrooms appear there too, and supposedly shamen gave them out as seasonal gifts, perhaps the winter solstice. First, you have the Santa Claus colors, red caps flecked with white. Then up there in raindeer country, you have "flying" raindeer, perhaps a not uncommon hallucination for people who rely on them for life. And then you have gifts of magic mushrooms. Could these be the very ancient origins of Santa Claus? The Phactors do have a fly agaric tree ornament, and many early Christian churches and manuscripts have drawings of "trees" that look pretty much like this mushroom. Hey, it's a good story! Sorry, thought there was a nice image in my files, but couldn't find one. Nice image at the link above, and here's a blog where TPP linked to other images of this mushroom just a couple of months ago. Ho, ho, ho! TPP has long joked about living in the maize and soybean desert of the upper midwest. Sadly this does a grave injustice to deserts because even the harshest desert has more biodiversity than our agricultural fields. 200 years ago this was tall grass prairie which has a surprising and substantial biodiversity and this same grassland community built some of the richest soil in the world. Here in Lincolnland the tall grass prairie is all but gone, less than 1% remains, and it was largely displaced by maize, and later soybeans. In a photoessay of the world's biodiversity, David Liittschwager would document all the biodiversity in a one-cubic foot volume found in a day. In a Costa Rican rain forest, 150 different species were found in his one-cubic-foot placed in the canopy of a strangler fig tree. And all over the world he found surprising biodiversity, and it's mostly surprising because humans pay very little attention to the little organisms. But in a maize field here in north central Lincolnland he got quite a different surprise. Sadly, he found nothing, nothing but maize. In our zeal, in our passion, in our desire for maize, our agricultural methods have come as close as possible to creating a complete monoculture. It's no wonder that more wildlife lives in our cities and towns than outside the city limits because out there it's a biological wasteland, except for crops. This represents nature bent entirely to human will, and again because little attention is paid to this, it's been estimated based on measurements here and there, that half of this marvelous prairie soil is gone, and so is the community that made it. So how smart are humans anyways? Do you need a crystal ball to see what the future may bring? Well, good old Bobcat Bill got his bobcat hunting bill (HB4226) through both houses of the Lincolnland legislature without even considering or allowing biological or ecological testimony. Here's a little background on this purely stupid action. Bobcat hunting was banned in Illinois in 1972 after the species became threatened. Bobcat populations have recovered in several counties - a recent SIU study found significant recovery in 17 counties in Southern Lincolnland, but there is no data to suggest at what level the population can sustain hunting. What is it that motivates some people to want to shoot (or trap) anything they see? Bobcats are important apex predators (and certainly not unwanted or undesirable as the definition of varmints and vermin suggests) that live on a diet of rodents and small mammals and contribute to an overall healthy ecosystem, and they are not responsible for the loss of quail or turkey as some proponents of this bill suggested. The bill that passed has significant problematic issues. First, the bill does not limit the areas or set bobcat population standards for counties to restrict hunting; hunting can be allowed in any county in the state. There may be a bobcat in our area, and if so then probably a young male, and this bill would allow our population of 1 to be hunted, and then there would be none. Second, the proposed hunting season overlaps portions of the bobcat breeding season, putting both bobcats with kittens and pregnant bobcats at risk. This is generally at odds with any good hunting practices. Finally, there is no emergency or automatic procedure to close the season if the species becomes threatened again. There has been significant citizen opposition on this bill and it helped to almost defeat the bill in the Senate (passed by one vote). There are other ways to enjoy wildlife than killing it, and it hunting is allowed where the bobcat is more populous, then the species will certainly not recover in other areas of the state. Ask the Governor to veto this bill by going to this link to sign a petition. Probably best to refrain if you're not a resident of this great nearly sterile state (more on this later). Do pass this blog on to other interested parties. OK, let's get some things clear, by definition if necessary. So a lot of plant experiments, especially those done in glass houses in pots require a growth medium for the plants. While mixing up a batch for some 240 pots, a security person on rounds came by and said, "So are you mixing up some dirt?" Our stock answer followed, "No, dirt is something you find under your finger nails and in certain types of books and movies." "We're mixing up some soil." This does mean that mixing soil can result in dirt under your finger nails. Similarly and widely misused are the terms disease and disorder. A disease is an illness that has a causative organism, a disease organism. A disorder is has a genetic or nutritional basis, but no causative organism is involved. Unfortunately the two terms are thrown around willy-nilly and used as basically interchangeable. So let's be a little more precise out there, people. Tree tunnels are pretty cool things. TPP pointed you to a photo essay about them once before, and this particular tree tunnel, the Dark Hedges, was included, but only one image. The link provided here will show you several more images of this beech tree tunnel that grows in Northern Ireland. The light gray color of the bark of beech trees is one of the things that makes them so spectacular, but when planted in two long rows, the effect of the trunks and their interlocking crowns is quite impressive, quite handsome. Sadly the first time TPP saw a picture like this was on a bulletin board in a school of forestry and the caption attached said, "Here's what happens when you chain your bike to a tree and come back 10 years later." Of course, trees don't grow that way, and ironically that very week the faculty were debating about reducing the amount of botany forestry students should be required to take. At any rate, this isn't going to turn out well. Straps, chains, cables, or the like simply will not under almost all circumstances help a tree that is prone to splitting. They just aren't strong enough to hold a split trunk in place, and see what is happening? The secondary growth of the tree is in the process of engulfing the chain, incrementally, year by year. This will produce a weak zone in the wood damaging both trunks. Trying to remove the chain may well now rip the bark and cambium producing quite an injury. Why do people do these things? Actually these are pretty vertically oriented trunks and no particular problem was evident that the chain was meant to alleviate. In all likelihood, this preventative measure will cause more real damage and help shorten the longevity of this tree. There are worse things you can do, but this isn't a good practice. And in case you didn't understand, this chain is at exactly the same height off the ground as it was when it was first placed there. Lichens are symbiotic organisms consisting of a highly organized fungal mycelium enclosing algal cells. What's strange about lichens is that without the algae, the fungus just looks like a fungus. Without the fungus, the algae is just algae. They only take on the form recognized as a lichen when the two organisms are in that symbiotic association, and of course, the term itself means "living together". This presents some interesting aspects of reproduction. This illustration is from the November 2014 issue of the American Journal of Botany. The sexual reproduction of the lichen is fungal in nature, so to form a new lichen, the fungus must capture a compatible algal cell anew. This illustration shows this very early stage where fungal hyphae (filaments) have found and encircled an algae cell. The proliferation of the hyphae and the division of the algal cell is a demonstration that the symbiotic interaction, the lichenization, has begun. The accompanying article by William Sanders provides illustrated diagrams of the sexual and asexual reproductive cycles of lichens, all very nicely done. All cat people know that the only thing to get a cat for a present is a catnip toy. Here's another of those terribly clever animations of Simon's cat. It perfectly captures the usual reaction of a cat to a new catnip toy. The animation is a present to us from the cartoonist. Enjoy. The Phactors were just sitting around the other evening reading the Sunday papers and assorted other periodicals, and eventually it came to their attention that they were cold. Say what? Yes, the temperature in the house was several degrees below what is considered comfortable. Sort of reminded TPP of the story about putting a frog in a pot of water and warming it so slowly such that the frog never jumps out and just gets cooked. Might the same thing happen to a couple of senior citizens that are found sitting there with their papers frozen? How come they didn't see why the furnace wasn't coming on? Naturally this event kicks problem solving activities into high gear, and the first suspect was the battery-powered thermostat, which itself did not seem to be responding. The decision was made to change the 2 AA batteries only to discover that a self-destructing battery was threatening the integrity of the whole thermostat, and leaving you wondering how it could have been working at all? So, keep some fresh batteries on hand because this is one of those things, one of those times, when fancy programmable thermostats reveal their weakness, they need some juice! Vandalism just about tops the list of urban dwellers pet peeves, so when a neighbor reports being the target of vandalism, everyone gets concerned. When the vandalism kept occurring they called the cops. Someone was cutting branches off their little newly-planted redbud at night. Sigh. How well TPP knows the repeated and wanton vandalism the neighbors were talking about because you would not believe how many shrubs and small trees have to be fenced in our gardens to protect them from vandalism in the winter. Bunnies. Cute, fuzzy, little vandals. At times it's a toss up about whether squirrels or rabbits are the biggest yard/garden vandals. Still glad it wasn't TPP who had to apologize to the police. Fortunately the predator police, red-tailed hawks and/or red fox, have been keeping the bunny population down a little bit this year. But the fences went up anyways by force of habit. What?? Hawaiian shirts are making a fashion come back. When did Hawaiian shirts ever go out of style? Certainly none of the tropical biologists TPP associates with have ever stopped wearing them, and hey, who gets to dictate tropical style if not tropical botanists. It was many years ago now that TPP got to thinking about professional attire, and the basic premise was that neckties were truly stupid, although to be fair, TPP was gifted a couple of Jerry Garcia ties that had pretty cool designs. But things had already gone so far that most of the ties TPP wore were actually intended to parody really stylish ties. One of the great things about being a tenured full professor is that you can do certain things with no repercussions what so ever, and dressing "non-professionally" is one of them. Almost immediately you recognize that your new tropical uniform helped distinguish you from the administrative class, i.e., that guy must be faculty because no administrator has the stuff to dress that way. Students quickly accepted Hawaiian shirts as normal attire. In fact very sharp ones finally figure out that botanical shirts were being worn in a thematic manner to coordinate with lecture and discussion topics. One administrator thought that TPP was not showing students enough respect by dressing so "casually"! "How does dressing like an undertaker show respect? ", one might ask. This story will get filled under good news! Getting decent aloha shirts (the preferred name) is much easier than getting a decent Panama hat. What have we learned from the recent spate of incidents of police violence on black victims? What have we learned from recent spate of incidents of police violence on black victims? Tom Tomorrow has the answers, at least from one perspective. All of this seems to be symptoms of a much more serious, troubling, and deep-seated problem in our culture, in our country. Did all of our city police departments use training films taken in Selma during the 1960s? And even in a "nice" Midwestern college town minorities are subject to unjustified profiling and harassment at a rate well above that of others. A sharp-dressing, minority colleague who happened to drive a somewhat flashy car told me how often he got stopped by traffic police, 4-5 times a year, and a non-sharp dressing botanist who happens to drive a non-flashy car in the same has never been stopped ever. So it must be the car. Right. Us residents of Lincolnland are pretty lucky. Yes, there are legislators here that deny science, but there are also legislators in the state senate like Bill McCann who can do science so fast and easy that he should give lessons to us field researchers. It's been a long time since bobcats (Lynx rufus) were common in this state because like other cats it's a top predator and they are always the most vulnerable. So ultimately the bobcat ended up on the endangered species list, but in some areas, the populations have increased so that bobcats are no longer in danger. Of course, no one knows actually because the state DNR wildlifers and university biologists don't have the personnel or funding to monitor and study such populations, to find out how fast or slow the population is growing or declining. But Senator McCann, well, he can just take a walk in the woods and you know every time he does he sees a bobcat, or 2 or 3, or 4 or 5. Really? Can we see the data? And how wide spread is this burgeoning population of bobcats in the state? The good senator just knows that bobcats now need to be hunted to manage their numbers. Heck, he don't need no stinkin' science, no troublesome data, we'll just make it legal to hunt those suckers. Now of course bobcat is a non-game species, and they need to be managed, to keep their numbers in check, because, well, because they might get a chicken or two somewhere. So McCann proposes just the most banal form of hunting, shooting something just to shoot something. It probably wouldn't matter if there really was some scientific study because the good senator would just ignore the findings and recommendations anyways, unless the bobcat study said, "Shoot to kill." This is quite the display of ignorance from one of the boom-boom boys. Once again Tom Tomorrow gets it just about right, especially if you watch Phlox News. TPP finds this all very depressing. Something really ugly is going on. Why are all baby animals so cute? One of the great side benefits of having done a lot of field work in Queensland Australia is that TPP has seen a lot of really unusual animals, but none is any more fun or any cuter than the platypus. TPP has observed them many times in several different places. They are apparently fairly common even if less commonly seen. Here's a nice article about the natural history of platypuses, and an image borrowed from the article. Never saw baby platypuses before, but they are sure are cute. You never know what you'll find when poking around in the deep, dark seldom-visited corners of an herbarium. So TPP keeps getting surprises. So you find a slim folder hidden away beneath a pile of unmounted specimens and out of curiosity you take the folder out for a look see. The folder contained 5 specimens from the Lamiaceae, the mint family, 2 species of Lamium (deadnettles) and 3 species of Nepeta (cat mints). OK, not too remarkable really. The specimens were collected in Greece in April '61, some 53 years ago. But the paper looks pretty old and clearly the specimens should be remounted, which fortunately can be done. The collector was Von Heldreich (Theodor), a German naturalist who lived from 1822 until 1902 making these specimens 153 years old actually. One wonders how long they had been at the bottom of that stack and why? Although hand-written in European script, the labels are legible enough once you work out a letter or two. Who knows? The species names have been entered into the database. They are all new species to our collection, so species folder labels have been printed, and the specimens moved to a new pile, a pile awaiting some volunteer action to remount them on modern acid-free paper. Once this is done they'll be good for another 150 years. This is one aspect of herbarium curation. Let's have some fun! You readers haven't had a challenge for awhile. Here's a photo, the only photo, that TPP got by email today. 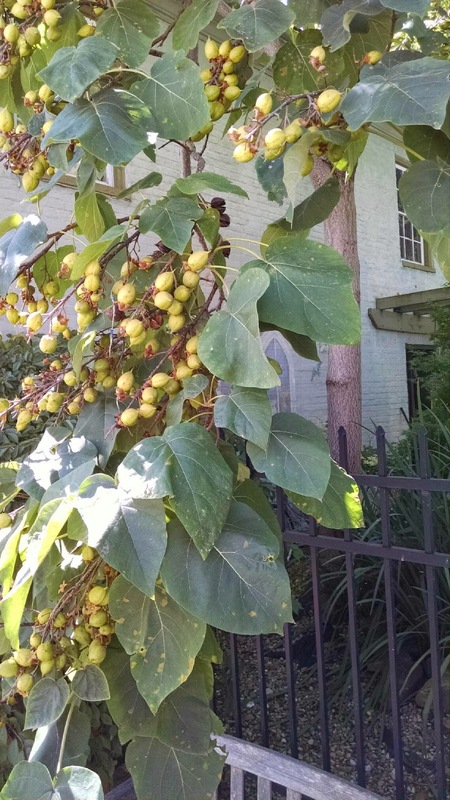 Can I identify this tree? What other information do we have? Well, it's a tree. It was photographed in Indiana, which really narrows things down a lot. And if you notice, there's a garden fence, so it could be an exotic ornamental. Oh, yes, TPP got this one. Wow! It's December Oneth! OK, having survived Thanksgiving and the obscene start to holiday shopping, here's a great little gift brought to our attention by PZ Myers, the Cosmic Genome Science Advent Calendar 2014. Yep, today you get to open the first little door and inside is little bit of science for your edification and enjoyment. Enjoy.